Have you ever taken the time to find out which awards something that is "Award Winning" actually won. I have seen hundreds of indie films at different video stores with a wide array of awards from different film festivals and never taken the time to see what awards they won from what film festivals. As far as I know they have all won the local indie film equivalent of the Razzie and are proudly proclaiming it. Most of those wreath style logos are usually just proclaiming that they were selected to be shown at a film festival, and I'm not sure if that counts as an award at all. 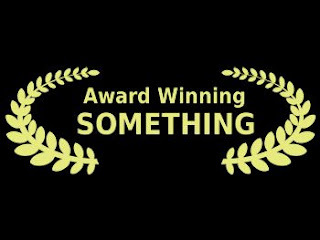 Pretty much any award you might give to someone they can claim to be "Award Winning" because they were awarded something once. I got an award for perfect attendance once when I was in Elementary school, but I think my report cards would show I wouldn't ever be able to claim I was an "Award Winning" student. Now thanks to a wide selection of framed certificates I can award myself and others with as many arbitrary awards as I want. These frames come with a generic unlabeled certificate that can be filled out with just about anything you'd like. 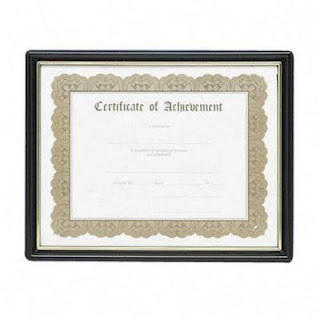 The "Certificate of Achievement" can mark any event (fictional or not) that you'd like to commemorate. If you want to permanently create a memorial to your high score in Pac-Man or let one of your co-worker know that they have an incredibly dashing haircut for a Monday you can't go wrong. Theses are the really cheap framed certificates so if you have something serious to award you might want to step up to a higher quality Executive Plaque. On the other end of the spectrum there are a lot of very affordable certificates for younger people, or just the young at heart. 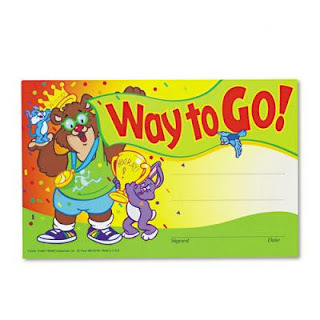 Since these come in packs of 30 you can buy several packs and award everybody in your office something special. You can hand out awards for cutest kid photo on a desk, best candy selection, or loudest acid rock. Everybody can be an Award Winning Employee.